Whether you are growing a big pumpkin to enter into a county fair or you want a unique white pumpkin for decorating your home around Halloween, the basic care of pumpkin plants is the same. The key to growing pumpkins is to start with warm temperatures, good soil, and lots of water. 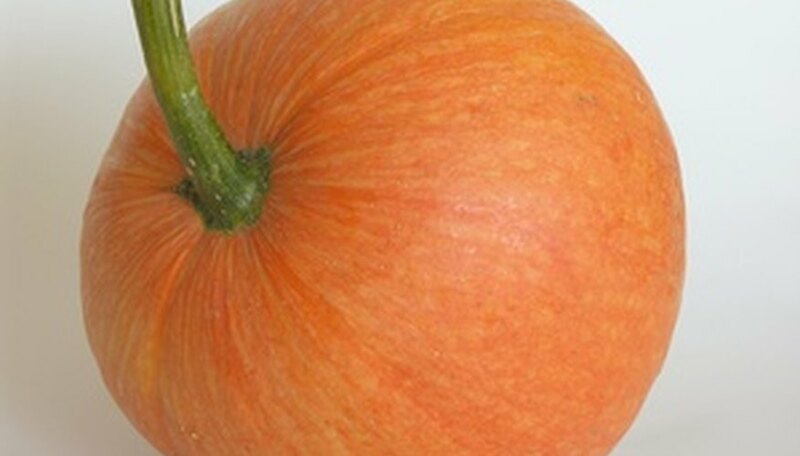 You can grow pumpkins from seed or transplant seedlings into the garden and expect to be pulling mature pumpkins from the drying vine within 90 to 120 days. Create a bed for your pumpkins by digging the soil in full sun to loosen it in a 3-by-3-foot area 10 inches deep for each pumpkin with bed areas 10 feet apart. Add compost to the soil by spreading a 4-inch layer over the bed and mixing it with the existing soil. Draw up a flat-topped hill over each bed with the hoe 2 to 3 feet in diameter and 5 to 6 inches deep. Pumpkins prefer soil temperatures between 65 and 90 degrees, so making the soil for the plant higher than the ground level will help increase the soil temperature. Plant into the hill after danger of frost has passed in your area. Plant five to six seeds 1 inch deep spaced evenly apart or transplant one potted seedling into the center of the hill. Water the hill well to make the soil fully moist and be sure to keep the soil moist as the seeds germinate and the transplants recover from being replanted. Pull out the weakest seedlings from your germinated seeds after three to four weeks once they are 4 to 6 inches tall to leave only two to three plants per hill. Continue to water the plants on the soil level, avoiding wetting the leaves, to keep the soil well moist. Never let the hill dry out. Weed the hill area below your pumpkin as needed to keep the soil free of anything growing except for the pumpkin plants themselves. To lessen the need for weeding, spread a 3- to 4-inch-deep layer of clean straw around each plant and over the hill. Fertilize with a 10-10-10 fertilizer following the manufacturer’s instruction soon after planting. Continue to feed your growing plant every month with a 5-10-5 fertilizer. Pumpkins are ready for harvest once the rind is firm and cannot be punctured by your fingernail and when the vine has turned dry and brown. Soaking your pumpkin seeds in water overnight before planting can help speed up germination. Set an untreated board underneath your pumpkins as they grow to keep the rind from resting on the soil. Lightly turning the pumpkin without bending or breaking the vine every few days can keep the shape of the pumpkin round. Treat diseases you see like powdery mildew as soon as possible with a fungicide which is safe for edible plants. If you need to use an insecticide, wait until evening after the flowers have closed so you don't deter or harm the pollinating bees you need for growing pumpkins.